This Months Crucial Conversations "Quick Hit" Refresher! For those who have completed the Crucial Conversations program and would like to continue their personal and professional development, please join us and refine your skills! Since these courses are designed for those who have already completed the Crucial Conversations workshop no additional cost will be incurred. 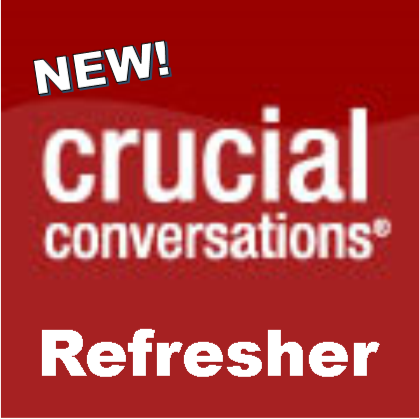 Participants will need to bring their Crucial Conversations Toolkit with them to class. "Get Unstuck" - If you don’t talk it out, you will act it out. Spot the conversations that are keeping you from what you want. Avoid moving to silence or violence during crucial conversations. Share facts, ideas, feelings, and opinions candidly and honestly.